So far this year, ten teenagers have already lost their lives in London as a result of knife crime. In response to these tragedies, people are rightly demanding action to keep communities safe. Stop cuts and police repression in Tottenham! Over Easter yet another brazen example of police corruption came to light. 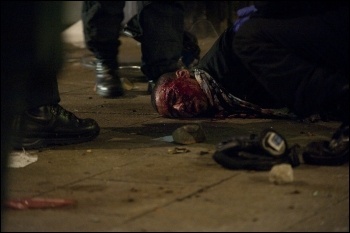 It was revealed that the Met police (MPS) buried a 2004 report warning of racist stop and search. This morning thousands of people have woken up to the devastation of their communities. It is a tragedy for the small shopkeepers whose businesses have been looted or set alight, workers whose cars have been burnt out, and perhaps worst of all for those who have seen their homes go up in smoke. LAST WEEK the European Court of Human Rights ruled that 'stop and search' powers given to the police by the Terrorism Act 2000 are unlawful, writes Greg Randall. 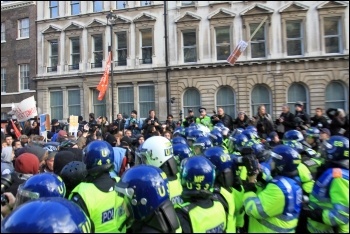 Home secretary Jacqui Smith has urged police forces to harass 'badly behaved' young people, writes Matt Dobson, Socialist Students national organiser. ON 7 July, while Britain remembered last year's appalling 7/7 terrorist attack, the right-wing media and government were fabricating panic and prejudice, writes Rozh and Senan.